Thanksgiving Turkeys Have All Found New Homes! 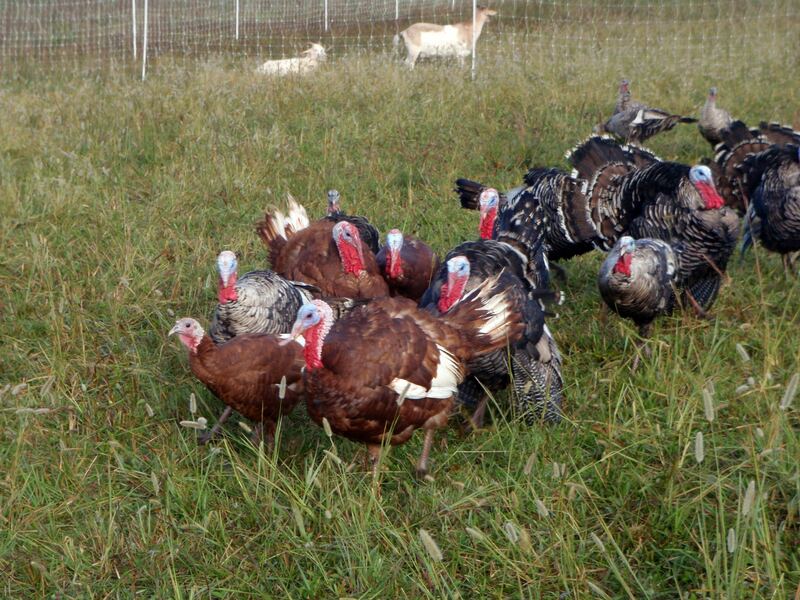 The turkeys enjoying fresh pasture grasses and clovers. 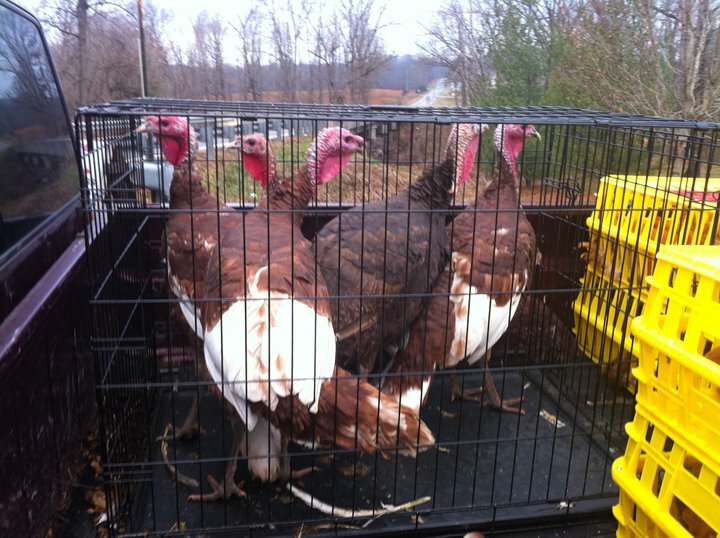 I’m happy to announce that all available Thanksgiving turkeys have been sold for 2011! Randy and Pam, Scott, Anna, Stephanie, Whitney, Joshua and Melina, Nate, Barbara, Constanze, Samuel, Brian, and Nancy. 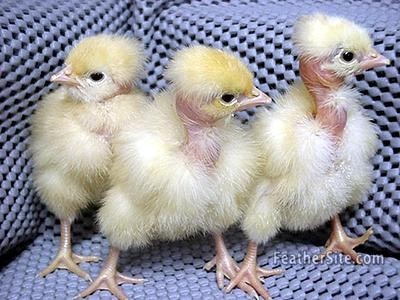 The strange and wonderful haircut of Naked Neck chicks. Our Naked Neck chicks (aka Turkens, but preferably aka Kentucky Redneck chickens) are doing well in their brooder. We started off with 52 of them 2 weeks ago and they’ve all made it so far and are growing quickly. Another couple of feathers on them and they will be ready to graduate into a pair of chicken scooters for 9-10 weeks. After that, they will either join our laying flock or become tablefare themselves. At that point we’ll get a good idea of just how good these supposedly “dual-purpose” birds are. The gene that gives them their naked neck also is supposed to promote larger breast size, which was the main problem with the other dual-purpose breeds we’ve tried. The genes may be linked on the same chromosome or something, but we’re hoping that these birds, once dressed, will more closely resemble the chickens our customers are accustomed to from the grocery store while being ultimately sustainable than a grocery store chicken. The other dual purpose chicken we’re working with are the Black Australorps. We started with 30 chicks from our incubator a month ago and all 30 have thrived in the brood house. They’ve almost completely feathered out and are more than ready to join Thomas and Not Thomas (the slightly older Australorp chicks) in the chicken scooter. Now the chicks and I are just waiting for a break in the rainy stormy weather to put them outside. The chicks do fine in the rain once they learn to go underneath the tarped portion of the scooter, but it takes a while for them to learn that so it’s best to put the chicks out for the first time when they’ll have a couple nice fairweather days to learn some outdoor skills before bad weather comes. The incubator is still full of 22 heritage turkey eggs and 20 guinea fowl eggs that are due to start hatching tomorrow through Tuesday. We’ve gotten several orders from people interested in guinea fowl keets, so after this first batch hatches the incubator will get loaded up with an exclusive hatch of guinea eggs. 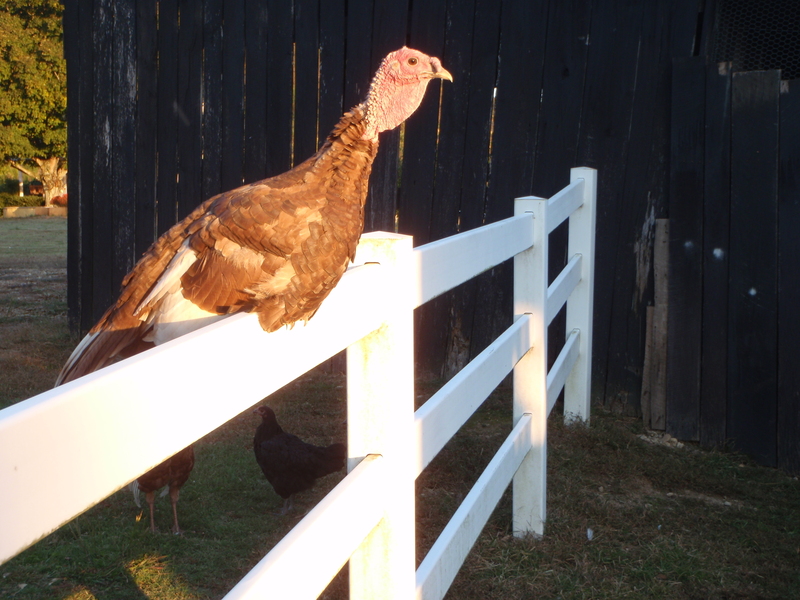 Now if we could just get people interested in Thanksgiving turkeys! 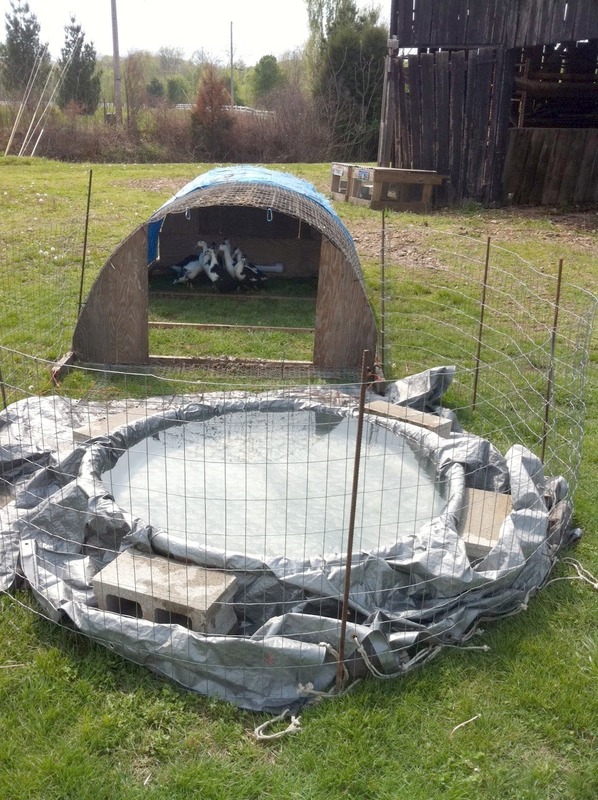 The ducks are enjoying their temporary grow-out enclosure complete with mini-pond. The Magpie ducklings also got to go outside. They’ve grown so quickly. They already weigh a couple pounds each at just 5 weeks old! As you can see above, I modified a chicken scooter to accommodate a small pond for the ducklings to play in and drink from until they get grown enough to go onto one of the real ponds. We’re also waiting until we can afford to order the poultry netting and charger to go around the pond to protect the ducks from coyotes. After they’ve got a little habitat set up around the pond, the ducks should need very little from us in terms of supplemental feed. Our hope is that the ducks can be a self-sufficient holon from which we can gather eggs and harvest meat with few or no inputs other than the fencing and charger. The tom turkeys are missing half their hens on this stormy morning. The last bit of poultry-related news is that 2 of our hen turkeys did not come back to roost last night. (Knock on wood) we haven’t lost any of the turkeys since mid-July other than the ones we processed, so we are thinking that we probably didn’t have 2 killed on one day by predators. Our hope is that they have created a secret nest or two and chose yesterday to begin sitting on the eggs. The rough part of this exercise is going to be having to wait 28 days (the incubation period for turkey eggs) to figure out whether the hens are sitting on a nest or got gotten. 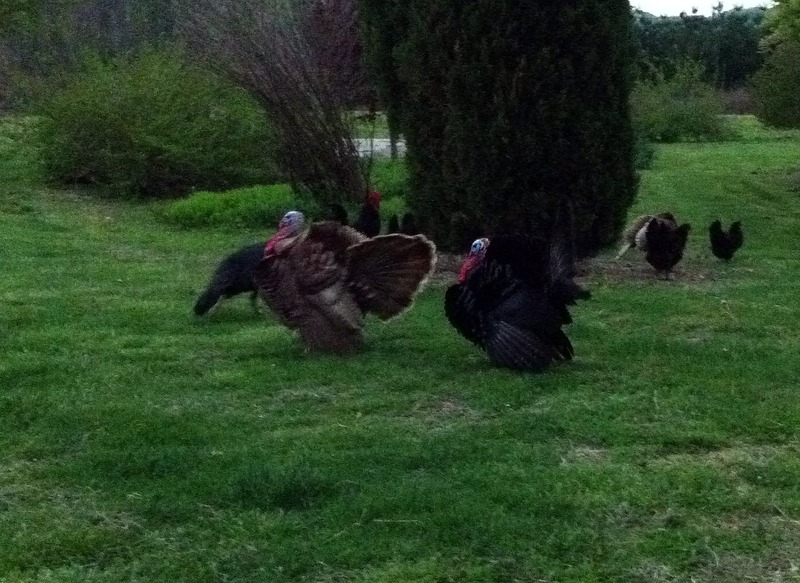 After 9 months of having the turkeys follow me around every day, it’s a little sad when a couple of them go missing. I’m honestly worried about the silly turkeys. Lindsey and I looked around for them for half and hour last night to no avail. Hopefully that means they coyotes can’t find them either. Good luck momma turkeys!